Countless parents have paced the floor trying to calm their fussy babies, often to no avail. 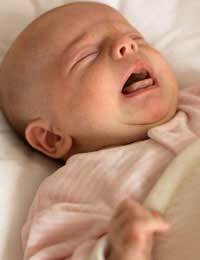 An inability to decipher a baby's cries causes parents considerable stress since what parents want most is to be able to meet their baby's needs and keep them happy. While parents often feel that their babies are trying to "talk" to them through their cries, many are exasperated that they cannot understand what their babies are telling them. Like many mothers before her, Priscilla Dunstan felt that her baby's cries were more than random babbling. She was sure that little Tomas was trying to express his needs. After careful observation and note-taking on specific sound patterns, she found that her baby's cries were distinctly different depending on what he needed, establishing that he was indeed expressing himself verbally in the form of a "language" that consisted of five basic sounds. Once she was confident that she had made a breakthrough in infant communication, she tested her theory with the babies of friends and relatives. Sure enough, her findings applied to other babies, too. Priscilla Dunstan is becoming a household name, having made appearances on a number of popular television shows, including the Oprah Winfrey Show. Her learning system, Dunstan Baby Language, has been made available to parents everywhere who wish to understand the needs that their babies are expressing from birth through three months of age. The system includes two DVDs, each offering a lesson in recognising the needs of an infant by listening carefully to their sounds. The first DVD introduces parents to the first three baby words, along with tips on "tuning your ear" and proven techniques to settle babies. In the second DVD, parents will not only learn the other two baby words and further settling techniques, but will witness Dunstan leading a class of new mothers in her system. Also included are a small reference book and a wall chart to make learning the system even easier. Running about 75 minutes, the DVDs are designed to help parents decipher their babies' sounds and therefore be able to better meet the baby's needs. Like all things, the Dunstan Baby Language system gets mixed reviews from parents. While many are delighted in their newfound ability to understand what their babies are trying to say to them, other parents will insist that mothers everywhere have been able to do this all throughout history. While it is true that most parents learn to understand their baby's cries, often describing a "hungry cry" or a "tired cry," being able to learn the sounds even before the baby is born could save many new parents countless hours of worry. For this reason, the Dunstan Baby Language system is making its way to the tops of baby shower wish lists everywhere.